A painting by Marilyn Monroe has been sold at auction for $78,000 (£43,000) while her personal phone book fetched $90,000 (£49,600). 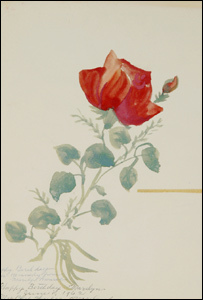 The 1962 painting of a red rose was initially inscribed to President Kennedy, but she never gave it to him, said auction boss Darren Julien. She later wrote a new inscription: "Happy Birthday Marilyn Monroe." The brown leather phone book contains hundreds of numbers and addresses, including that of Frank Sinatra. Other famous friends such as Peter Lawford, Henry Fonda and Jean Kennedy Smith, as well as ex-husbands Joe Dimaggio and Arthur Miller are in the book. Sinatra has five different phone numbers in the book. The phone book was bought by GoldenPalace.com while the painting was sold to collector David Davis, who runs an art gallery in Rhode Island.